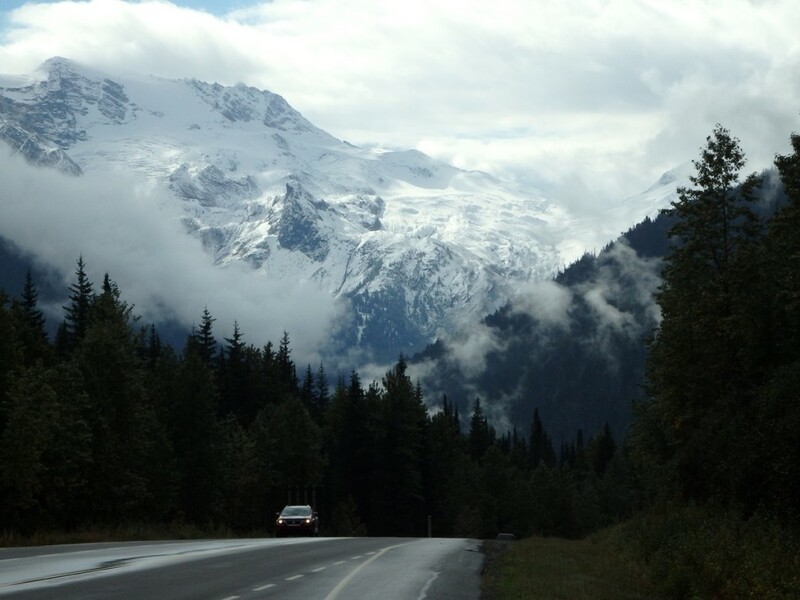 I guess most people when they hear the name of British Columbia they imagine high mountains, endless forests, wild landscapes and rain. We had exactly the same expectations when we entered Canada’s westernmost province driving from Lake Louise via the spectacular Kicking Horse canyon. And we were right. Our first stop was the community of Golden where we spent a night. It is a really small town dominated by Canadian Pacific Railway, logging and tourism (quite a common mix in these parts of Canada). Located in a deep valley it is surrounded by the mighty Rockies to the east and the equally impressive and impenetrable Selkirk Mountains to the west. And yes, it was raining, or at least drizzling. But even in such weather there was no hiding the spectacular scenery. Especially the snow-capped Selkirks towering ominously to the west. After breakfast in Tim Hortons (which some say is a true Canadian icon) we drove west on the Trans-Canada Highway (TCH) towards the Rogers Pass and Glacier National Park in the heart of the Selkirks. 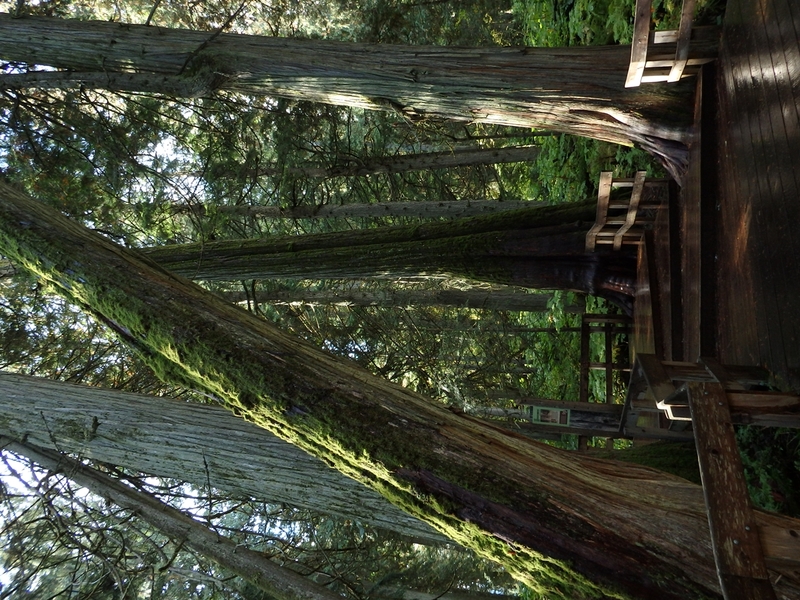 The park was established in 1886 (making it one of the oldest national parks in Canada), a year after Canadian Pacific Railway built the line across the pass bringing travellers into the region. Later in 1916 the pass was bypassed by an 8km tunnel, the tourists disappeared and with them most of the infrastructure. Then in 1962 the TCH was build and tourism recovered. 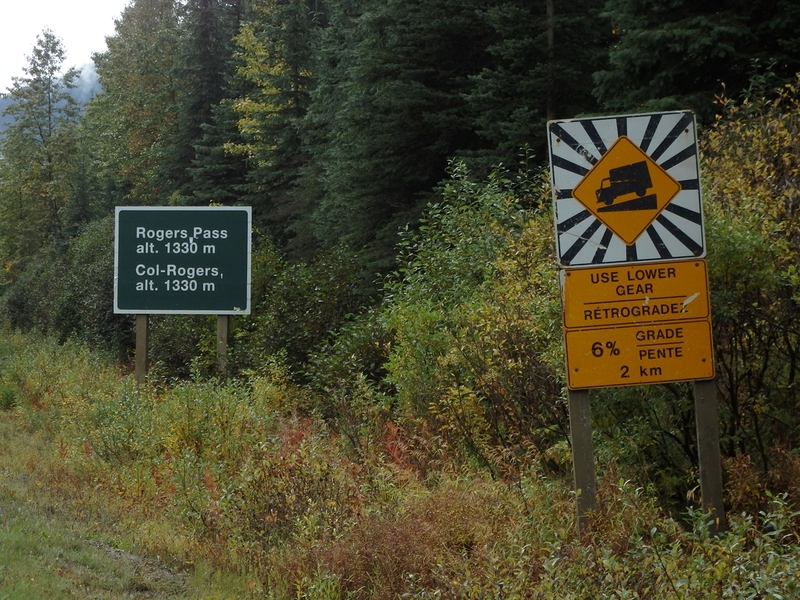 The TCH from Golden to Ravelstoke via Rogers Pass is long and lonely, with a very few services (and no fuel for about 150km), but also a very scenic drive. During our crossing the weather wasn’t perfect so we only saw glimpses of majestic mountains and glaciers towering over the twisted route. Low hanging clouds and mist obstructed visibility but also enhanced the wild feel of the place. We stopped briefly at the pass to look at the memorial dedicated to the completion of the Trans-Canada Highway, something which, as a road geek, I simply couldn’t skip. 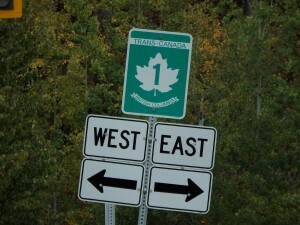 Here I also have to mention that Trans-Canada Highway is 8030km long, which makes it one of the longest national routes in the world, and one day I would like to drive its entire length. From the pass we descended west and the weather immediately improved. Taking advantage of the sunshine we stopped at two short board-walk trails. They are actually in Mount Ravelstoke National Park located just west to the Glacier NP. 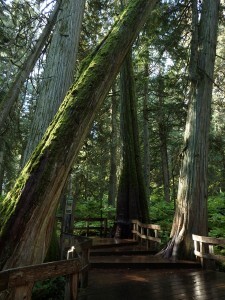 The first one, the Giant Cedars Boardwalk Trail, runs for half a kilometre through the old-growth cedar forest. Some of the tress along the trail are over 500 years old and they are truly magnificent, looking much like pillars of an enormous Gothic cathedral. I love forests, especially massive old-growth ones, and miss such experiences in the UK, one of the least forested countries in Europe. The next trail, located just a few kilometres down the road is the Skunk Cabbage Boardwalk Trail and it goes through a completely different environment. Here boardwalks lead visitors over a river valley swamp full of birds and other small fauna. These two trails, in such close proximity and yet so different, are great examples of varied mountain landscapes of British Columbia. Oh, and skunk cabbage didn’t smell of skunk. Just before reaching the town of Ravelstoke we took the turn-off to Meadows in the Sky Parkway which climbs astonishing 1330 metres in 16 switchbacks and 26km to reach an elevation of 1835 metres above sea level. There are a few viewpoints on the way up offering great vistas to Ravelstoke and Columbia River valley but for a really spectacular 360 degrees panorama we walked from the the upper parking lot to the fire lookout at the summit of Mount Ravelstoke. From there one can see endless mountain chains stretching far to the horizon. In all directions. 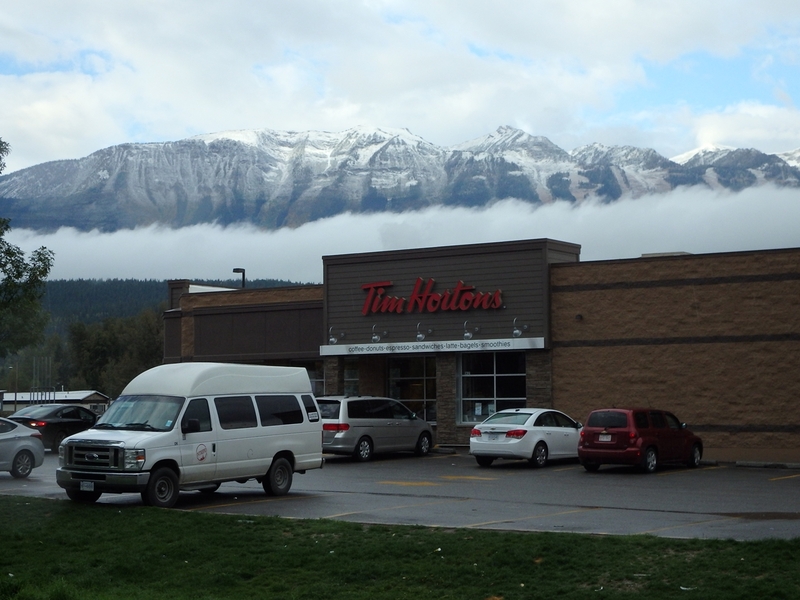 This is British Columbia as I have always imagined it. After driving back down we stopped at the Ravelstoke Railway Museum which focuses on the history of the Canadian Pacific Railway, which was the first transcontinental railway line in Canada. In fact this line was part of the formation of Canada as we know it. The colony of British Columbia only agreed to join the newly formed Dominion of Canada after the promise of building a railway from the east to the Pacific. Inside the museum there is a huge steam locomotive and one sleeper carriage (which you can enter) as well as some smaller exhibits. Outside there are more railway cars including a massive snow plough used to clear tracks through the Columbia Mountains (which the Selkirks are part of). 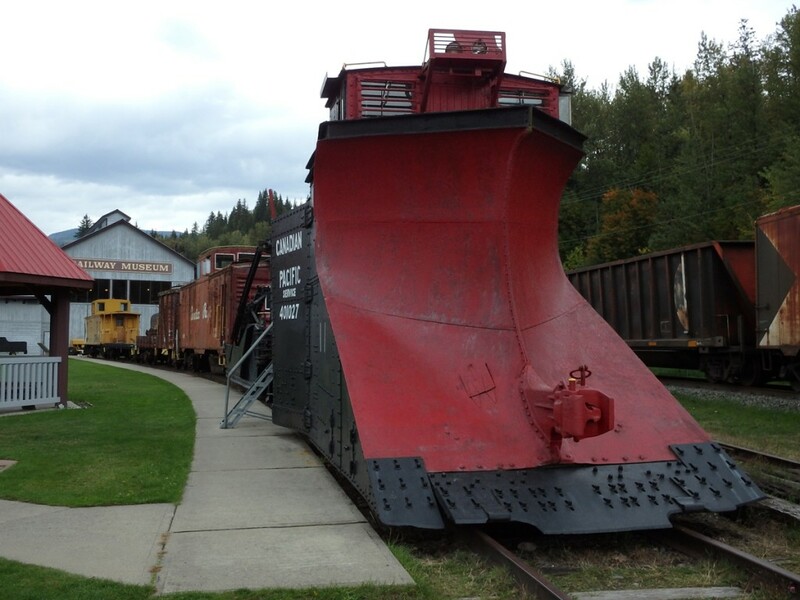 It is enormous and helps one to imagine how much snow falls in this part of British Columbia. Literally metres every year. From Ravelstoke we travelled west across yet more mountains until we finally reached the Okanagan Valley where we turned south. This valley is different than the rest of British Columbia. Instead of dense forest and a harsh wet climate it offers dry and warm weather as well as open landscapes, nowadays dominated by the fruit and wine growing industries. Its unique climate is largely due to the fact that the valley is protected from the west, north and east by tall mountains but opens south towards the sunny central Washington state in the US. It feels like if is someone transplanted bit of California 1000 miles north to Canada. We arrived at the town of Vernon on a glorious sunny and warm afternoon to stay there for the night. The following day we turned west again, heading towards Vancouver. 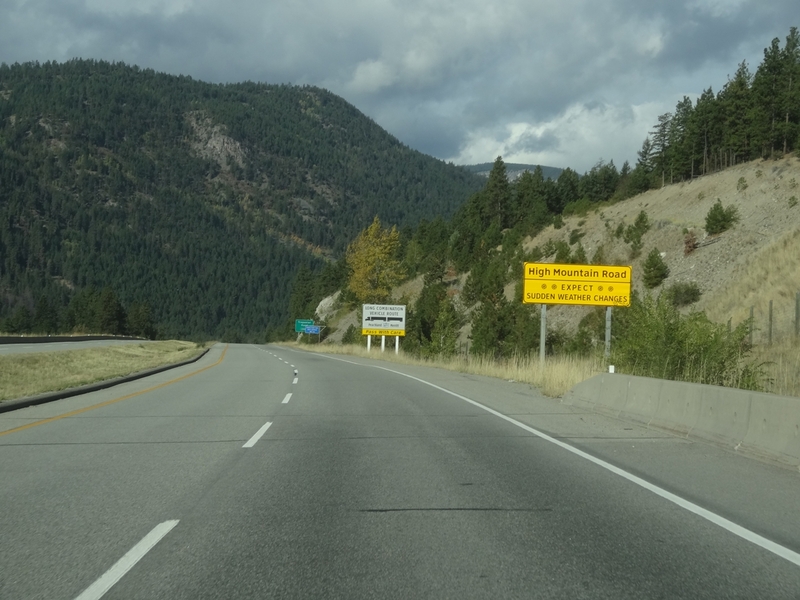 It is about 400km from the Okanagan Valley to Vancouver and three quarters of the distance involves driving across more rugged mountains of the interior British Columbia. The roads are good quality motorways most of the way but services are sparse (sometimes over 100km without a gas station) and there are plenty of warning signs advising carrying snow chains, checking brakes, watching for “long combination vehicles” (essentially the massive multi-trailer trucks) etc. 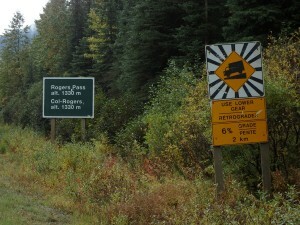 One of my favourite signs reads: “High Mountain Road, expect sudden weather changes”. One can only imagine that it can be a tough drive there in winter. 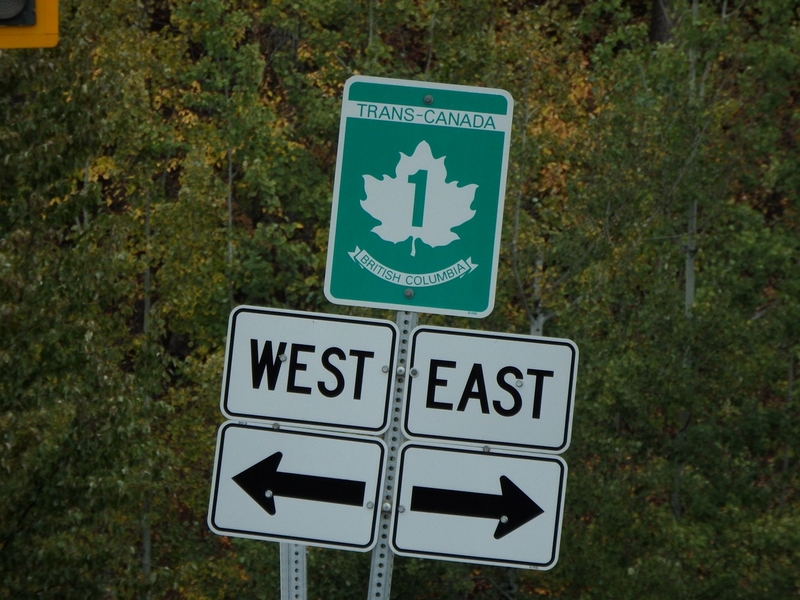 In fact the Highway 97C crosses the Pennask Summit at the elevation 1728 m (5760 ft) above sea level which is actually higher then the Kicking Horse Pass in the Rockies where the Trans-Canada Highway crosses the continental divide. Luckily we only experienced a bit of drizzle and no major issues. For the last stretch towards Vancouver the road follows Frazer River through its flat bottom valley but mountains are never far away. In fact we stopped for a picnic at the Bridal Veil Falls Provincial Park, one of the many waterfalls on the slopes of the valley. 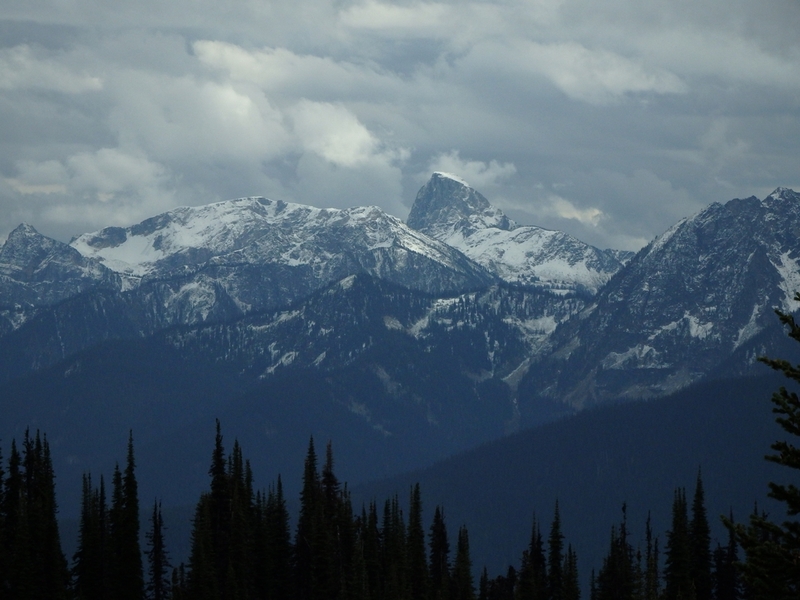 The mountains here are fully exposed to the wet North Pacific climate which results in plenty of precipitation and, in effect, a temperate rainforest environment. We had a short walk to the base of the scenic 60 metres tall waterfall before munching some bagels with ham straight from the car boot. Sophisticated we ain’t. From the falls it only takes over an hour (obviously if traffic allows) to reach Vancouver. So here we are. In a bit less than two days we managed to to drive 800km ( almost 500 miles) and cross the whole width of beautiful British Columbia. All the way from the cold, even snowy continental divide in the Rockies to the wet and mild Pacific coast north of Vancouver. In that distance we drove through numerous high mountain passes, quite a few small towns, and long stretches with not much civilization along the road. But now trendy and sophisticated Vancouver was awaiting us. More about it soon. 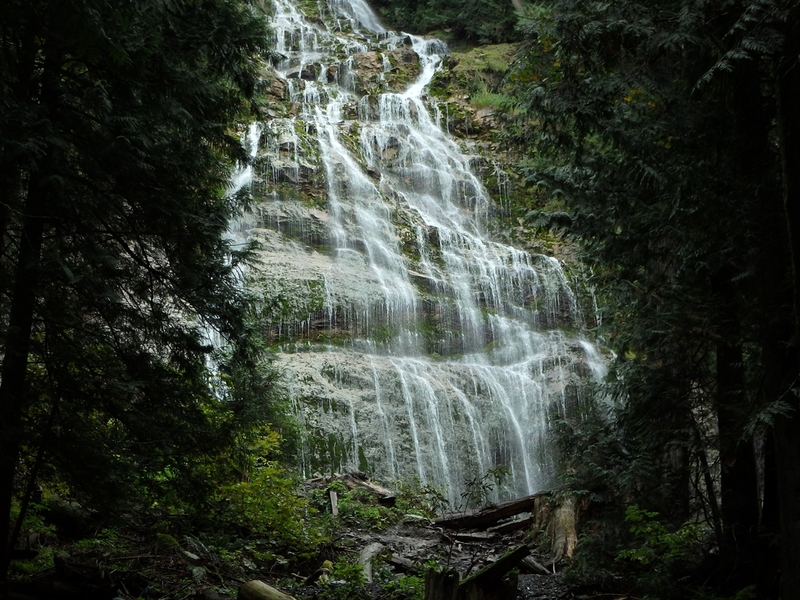 This entry was posted in Uncategorized and tagged Bridal Veil Falls Provincial Park, British Columbia, Canadian Pacific Railway, Giant Cedars Boardwalk Trail, Glacier National Park, Golden, Mount Ravelstoke National Park, Okanagan Valley, Ravelstoke Railway Museum, Rogers Pass, Selkirk Mountains, Trans-Canada Highway on March 30, 2016 by admin.